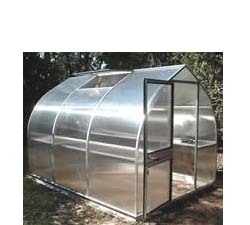 Riga Onion series greenhouse is the absolute sturdiest hobby greenhouse available due to its "onion" shape. The Riga's are rounded on the sides coming to a point on top, which helps shed snow and lessens the effect of high winds. The size options for the Riga's are varied and have a great range of lengths from fairly small to very large. They range from length of approximately 7' up to 17', and also have two width options of 7' or 9'. This means that just about any gardener can find a just right for them size. The heights of the Riga vary depending on the model from 7' to 7'6". Similar to the Juliana Premium, this is nice while you are standing in the middle of the greenhouse, but again we noted that we had to do more stooping inside the greenhouse than in the Rion Hobby Gardeners or Prestiges because of the way the roof slopes more severely from top to sides. If you are a taller than average gardener and work inside the greenhouse much, this can be a noticeable drawback to the Riga's and the Juliana Premium. Installation of the greenhouse was in a range that we would call moderate - more difficult than the Rions, but less difficult than the Juliana Premium. The instructions were fairly easy to understand and follow, but the greenhouse did require a few tools to install versus the Rions that snap together with no tools whatsoever required. Conclusion: The Riga Onion series is an extremely durable and well-constructed greenhouse. It comes in a nice range of sizes, both width and length, and was not overly difficult to assemble. We weren't thrilled with the looks of the onion shape, but if that is a style that suits your eye, then you can't go wrong with whichever size Riga you select. Also, be aware that the Riga's are approximately double the cost of the Rion Hobby Gardener (our #1 pick) per square foot. >> Riga Hobby Product Specs!